We seem to be living in the Golden Age of geekdom, where even lesser known characters from the comic books of my youth are being given the full-on blockbuster treatment. Case in point: Doctor Strange, the Marvel Universe’s own sorcerer supreme, created in 1963 by artist Steve Ditko, whose brilliant, creative and often trippy style of art was a perfect fit for both the time and the good doctor’s strange, interdimensional adventures. 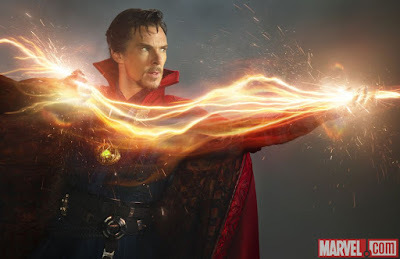 Flash forward to 2016 and the Doctor Strange movie boasts a cast (Benedict Cumberbatch, Tilda Swinton, Mads Mikkelsen, etc.) that betters that of most Oscar-bait movies and stunning visuals that still honour Ditko’s awesomeness. Clearly, it is a good time to be a geek. To celebrate, I wanted to find a cocktail that would be worthy of Doctor Strange. Doctor Strange’s Sanctum Sanctorum (aka his magical residence for you non-geeks out there) is in New York, so my first idea was a Manhattan, but that didn’t quite have the flair of Doctor Strange (or Benedict Cumberbatch). However, it did lead me to a variation of a Manhattan called a Sherman, whose recipe comes by way of the Old Waldorf Astoria Hotel (opened in New York in 1893 and demolished in 1929 to make way for the Empire State Building, which is suitably cool) and contains absinthe (which seemed suitably trippy). Yes, that is my normal shot glass and yes, I’ve clearly leaned in to my geekiness. Most Sherman cocktail recipes call for rye whiskey or leave it up to you to choose between rye and bourbon. The Clockwatching Tart and I developed a crush on bourbon during our trips to Kentucky, so this was an easy decision to make. Absinthe smells and tastes like black licorice / anise but it isn’t as overwhelming as I might have expected. That said, it is still there to round out the flavours and not dominate them, so go easy. I used a tiny little salt spoon to make sure I didn’t overdo it. The craft beer revolution has been in full swing for quite some time now, but the craft cocktail craze is relatively more recent (and much to our delight). Our favourite craft beer bar now boasts a fantastic cocktail menu as well and a relatively local distillery, Dillon’s Small Batch Distillers of Beamsville, Ontario, has a display of different bitters at the local LCBO. Good times all around. The lemon twist isn’t just to look cool, the actual twisting is what releases the oils, which adds both aromatics and flavour to finish off the cocktail. In the end, both The Doctor Strange (the cocktail) and Doctor Strange (the movie) get perfect scores of 4-out-of-4, as all four people at our little cocktail-party-turned-movie night loved both. Long may the Golden Age of geekdom continue!